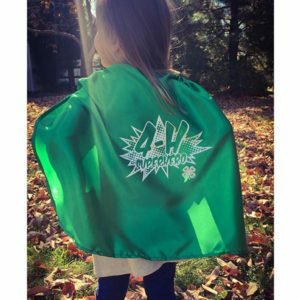 Michigan 4-H Foundation	» Blog Archive » Be a 4-H super hero: leave a legacy! Be a 4-H super hero: leave a legacy! 4-H has loyal community supporters. Supporters who care about longevity and legacy – not only within our personal families, but within our 4-H family and community. 4-H also has generations that have grown up through the program and have become an extended family. Those who care deeply about 4-H can be a 4-H super hero by leaving a legacy through a planned gift. Examples can include everything from a simple bequest – leaving a percentage of your assets – to stock gifts in support of 4-H. While a survey conducted by Caring.com indicates only 42 percent of U.S. adults currently have a will, it can be a rewarding process to work through for you, your family and causes you care deeply for. Estate planning is critical to managing your assets and protecting your family. A will provides clear direction for the distribution of your estate. Donors may bequeath a specific amount, a percentage of the estate, or a residual after other distributions from an estate are fulfilled to support Michigan 4-H. Gifts of life insurance policies or retirement funds. Planned gifts may establish a new or grow an existing perpetual named endowment or fund. Gifts of any type may be designated to support a specific 4-H program area, county 4-H program, Kettunen Center or the Michigan 4-H Children’s Gardens. Unrestricted gifts may also be made to support future and emerging needs of 4-H youth development. Documented planned gift donors qualify for recognition in the A.G. Kettunen Society during their lifetime. Both future and realized planned gifts can count toward the Campaign for Michigan 4-H’s Future $12.5 million goal. If you are interested in exploring planned gift options in support of 4-H, please contact Amanda Masters, assistant development director for 4-H, at (517) 884-4691 or by e-mail at amasters@msu.edu, to verify that your gift intent can be met. Consulting with personal legal counsel and/or a tax adviser for definitive assessment of the tax benefits of and limitations on planned gifts is also recommended.